Cold, wintry weather is upon us. But, that doesn't mean we can't have warm thoughts! 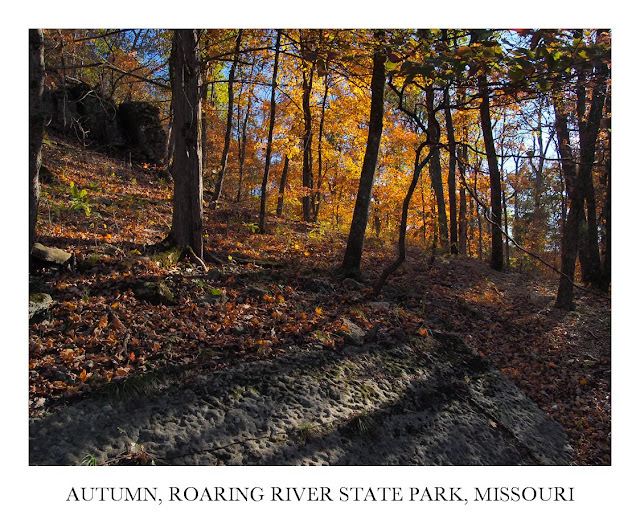 This photo is from our October camping trip to Roaring River State Park located in southwestern Missouri. The park is a wonderful place to spend some time relaxing with family and friends. A trout fishing destination known for its beautiful natural spring that feeds the river and local trout hatchery, this state park also offers some good hiking trails with access to gorgeous scenery. This year, we lucked out and experienced some marvelous fall colors.